LOVE Rush! Thanks for the updates. I've been enjoying the World Cup too. We're looking forward to being in Europe in a World Cup year -- it's such a huge event over there. We're keeping our fingers crossed for France. Their win in 1998 (while we lived there) was something to experience. The party took to the streets throughout the country and lasted for weeks! I've only watched the US-England game, because the times are bad for me here in Azerbaijan. I missed seeing Extreme once when a friend and I went to a Van Halen concert without any tickets. 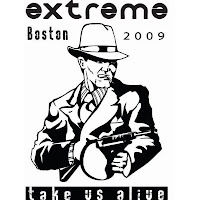 While we tried and eventually succeeded in buying some scalped ones, we missed Extreme. 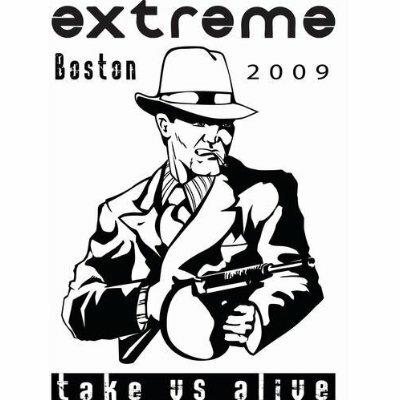 I didn'r even know Extreme was back together! Looking forward to the movie challenge, wonderful post as usual. Thanks for your visit, why not the BBC SYMPHONY ORCHESTRA? I actually watch the matches on mute. The drone is really migraine inducing. It's always amazed me that you don't hear the same crazy crowd thing at golf matches that you do at other events. What's with that? Those horns do drive me nuts! At first I thought something was wrong with my TV... but I do love watching the matches. I have been addicted to the World Cup too. And yeah, those plastic horns are driving me crazy. They are really annoying. They had a game on in our break room, and I said, "why does it sound like they're filming from a bee hive?" I totally agree with you on the horns. It was like giant bees. They need to stop that. They lost me as a viewer. Hey, I gave you an award today. It took me ten minutes to realize that the horrible drone wasn't a sound problem on my TV but the horrible sound of those plastic horns. Serbia played the first game yesterday, and I found myself thinking how can our soccer players concentrate with all that noise. Hi me again I forgot to mention I walked down the Hollywood walk of fame 2 yrs ago, mighty impressive, not bad from little ole me from Dorset UK. Ironically, the radio show I'm listening to right now is talking about those stupid vuvozela horns or whatever they are called. They are annoying, but I haven't been watching any of the games in their entirety so far and I keep the volume down. My wife watches the games more than I do but I don't watch very long with her because she listens to them in the Spanish station. I live here in L.A. and I didn't hear about the Rush star. The World Cup is HUGE in my neighborhood. Shopkeepers are donning their sport shirts and the local restaurants and markets have announcements on game time. I have my dirty dozen all ready to go. I keep going back and swapping movies in and out – it’s a tough call. This will be my first blogfest! Nicole, you are cool in my book, then! Yvonne, I meant that was a good pick for you. Rayna, Clarissa, Mr. Stupid, Helen, Dez - thanks for agreeing! I can't take more than five minutes of that noise. Journaling, wouldn't that be wild? If everyone was screaming at a golf match? Will, the owner claims he will never allow Rush into the Hall! Southpaw, glad you selected this one as your first!! Oh, come on, Alex... you can take your shirt off. You're among friends! No Staypuff pokes or anything. DH is a major football (soccer) fan. I live it all season, now the world cup. The only problem is, not only do I have to listen to the horns on TV with an Arabian commentator, who never takes a breath. But - our neighbours in the next field are South African and have the real horns. They are also players with the Rugby 7's, so I get to hear it with both sports! Not a big soccer fan, but I will watch the World Cup just because it's such a globally popular event. Hart, I might not get Staypuff comments, but I'd probably blind someone with my paleness. Glynis, I'm sorry you're getting a double-dose of that noise! I keep forgetting to open twitter so mine is usually a few weeks behind the game except for automatic updates when I write a new post. I haven't watched the World Cup but I read this morning they were working to reduce the broadcast sound mix to reduce crowd noise. Hope it works. Carol that would be nice! I’m not a big sports person so hearing the results on the evening news is more than enough coverage for me! As far as the bands go…well, let’s just years ago when my daughter went out on her own and MTV was not constantly on in our home, I fell far, far behind. I haven't heard of either group. I'm pretty sure hating Rush isn't allowed. The horns are crazy at the world cup! Can't imagine trying to play there! I am not a soccer fan at all so I haven't watched the world cup. Kansas Bob asked if anyone was watching the world cup, and I told him I didn't know the world had a cup and that it was my turn to watch it. If they want a guy to watch chinaware they should let a guy know. I don't think I have ever heard Rush, but happy for you your band got a star! Congrats. Guys watching chinaware is a bad idea, Gregg. And you've really neaver heard of Rush? They're Canadian - been around almost forty years. Looking forward to that Rush DVD, Alex. A co-worker back in Hartford went to see the film on June 10. If it played in Phoenix, I did not hear of it. We were probaly boycotted. I have the Extreme CD (did not opt for the DVD as I just do not seem to find time to watch them much) and it is a good performance. Disc, I was really impressed with how well Extreme sounded live. I'll probably get both. Would try to listen sometime soon or ask my kids about Rush!